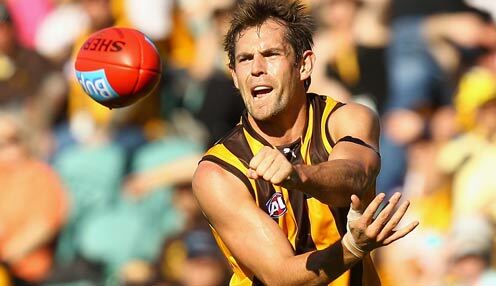 Hawthorn have been hit by the loss of Luke Hodge for the start of the season. Captain Luke Hodge is set to miss the start of the AFL season for Hawthorn. The Hawks want to avoid a repeat of last year, when they lost Hodge for around half the season due to injury. So they are content to be patient with him as he enters the final phase of his recovery. Hodge has not played in any of the NAB Cup games this year, and if he is fit by the end of the month it's likely he will begin his return via the VFL. The 28-year-old was a premiership player with the Hawks in 2008, topping that experience by claiming the Norm Smith Medal. Knee and calf injuries hampered Hodge for much of 2012, but Hawks football manager Mark Evans says he is now close to full fitness. He is pumping up his training another notch so we expect he will be playing some footy in round one, I would think. "He is pumping up his training another notch so we expect he will be playing some footy in round one, I would think," Evans said. "Whether that is AFL or not depends on a few things and so that is yet to be determined. But he should be playing football of some sort in round one." Hawthorn will go into the new season minus four of the players who took the field in their losing Grand Final to Sydney. Matthew Suckling and Brendan Whitecross have long-term injuries, while the Hawks lost Clinton Young to free agency and delisted Tom Murphy. Dynamic forward Cyril Rioli, who rolled an ankle in the opening NAB Cup match, will be fit for round one. Three players who missed last week's game against Richmond with minor injuries - Luke Breust, David Hale and Brad Sewell - will likewise be able to play. Hawthorn are 1/1 to win the Grand Final. The Hawks are 1/1 to finish in the top eight. Don't forget all of the fantastic markets we have to offer, including In-Play betting, can be accessed on your mobile phone and tablet with the new and improved bet365 On The Move.